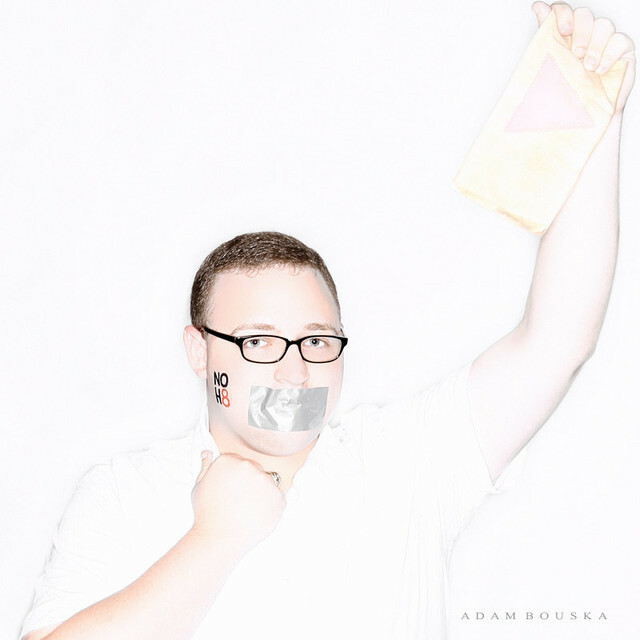 In my NOH8 photo I am holding a pink triangle armband from Poland that gay men were forced to wear during the Holocaust. Today we reclaim this symbol from history and empower ourselves with pride...but we must also never forget. This item, along with posters, photos, and buttons from GLBT history are on display in the GLBT Resource Center at Texas A&M University (http://glbt.tamu.edu) which I have had the honor of running since we opened in 2007. Texas A&M University is an institution with a reputation of being conservative and homophobic, but it is changing. On October 4, 2010 we became the first university in the country to host Adam Bouska, Jeff Parshley, and the NOH8 crew for an open photo shoot. In three hours, hundreds of people made a statement on our campus that "Hate is NOT an Aggie Value" by joining the NOH8 Campaign. Another step in the right direction for our community here in Texas.